It might be the “most wonderful time of the year,” but it is also a time when travel nightmares are often turned into reality. Lengthy delays at airports due to unpredictable weather conditions, traffic jams and super crowded roads, and stays at family homes or hotels that challenge your ability to deal with all kinds of challenges are but a few of the issues associated with holiday travel. And if you think you have it bad, just imagine being the family dog that is along for the ride. While I would strongly urge you to never use air travel for holiday travel with a dog because few airlines have really mastered the art of handling animals well (you need only read recent headlines about cats and dogs breaking free on the tarmac or pets being handled badly in the passenger areas of planes to see what I mean), ground travel can be just as difficult. Because our dogs are often part of our family, however, it is important that you take any steps needed to ensure that they travel safely, comfortably and easily with you during the holiday season. In this article, we’ll consider 11 different things you can do to get ready for holiday travel and make sure it is a good journey for all involved. I won’t look at air travel because that alone merits a lengthy article about the best carriers, the best things to do to ensure your animal arrives safely and travels comfortably, and much more. Instead, we’ll look strictly at car travel. The highways and byways of the United States see some of the peak levels of traffic from the days before Thanksgiving and well into the New Year, and many of the vehicles you see are carrying humans and pets, along with loads of presents, purchases and belongings. It is not inaccurate to say that few of us are at our personal best when traveling during the holidays. Whether we are over-tired from non-stop schedules leading up to traveling or just burnt out from so many holiday activities, most of us dread lengthy car trips at one point during the holiday season. What if we cannot reach our destination without stopping overnight at a hotel or motel? What if we are stuck in the car for a long time? What if the dog is seriously car sick? Those are just a few to consider, and once you do recognize your potential issues, you can then take steps to be fully prepared. Over the rest of the list, we’ll actually look at ways to address some of those what if situations, along with a lot of other potential hurtles. However, at this point in the discussion, it is best to accept that there could be a problem, or multiple problems. You know how they say that the first step in overcoming a problem is to recognize that there is one? Well, that is the first smart thing to do to be fully prepared for winter and holiday travel with the dog – accept and recognize that there will probably be problems and then proactively form solutions for them if/when they occur. You may be taking a journey that requires a single overnight along the way, or you might find out that the traffic delays or other issues (car problem, weather, etc.) make it wise to stop and stay over somewhere for the night. In the past, this could have been a serious problem. Why? How would you know which locations had pet-friendly options? How could you plan from inside a moving car? Today, though, a mobile device and internet connection can allow you to find the nearest hotels/motels and pet-friendly spots in minutes. You can use regular Google searches and travel sites or opt to seek out the closest places through sites like Airbnb. The point is that you can find solutions as soon as you need them, or you can be super proactive and map out where you might run into traffic issues or find a good half-way spot. Then, just book ahead at a pet-friendly location! I love reading articles about disaster prepping. I’m endlessly fascinated how people can build “bug out” bags with enough gear to rough it for a few days or survive the zombie apocalypse with a backpack and pocketknife. I especially love that so many people have packs for their dogs to use in the event that a bug out is required, and I suggest that you keep something like that in your car during a long road trip. I don’t mean you should stock your car with all that you need for the end of the world. Instead, I think it is a good idea to consider the essentials and a bit extra for safety. Why? Let’s say you don’t intend to stop for the night but that the weather has another idea for you. Let’s also say that you find yourself stuck in some seriously bad weather and end up sitting along the side of the road with a lot of other travelers unable to drive on the icy or snow-covered roads. You might find yourself in serious trouble without roadside emergency supplies, and that goes beyond a few flares and basics. Before you hit the road during the winter weather, always check that you have emergency supplies that can keep everyone safe until the roads are passable or help arrives. Now, that is your kit. And you might also want a crank-powered radio, a battery backup of some kind, and super survival tools like a tiny camp ring, matches and so on. I know it is extreme, but in late 2018 a quick winter storm that dropped only 6” of snow managed to paralyze the New York-New Jersey area, causing some to be trapped in their vehicles. Three hour drives became 11 hour nightmares, and many people had to call for help. I know this seems like overkill, but you can realistically fit most of your dog’s gear into a single, small duffel that is tucked into the empty carrier or resting on top of it. I went to visit my sister over the holidays, and because we have a late night of family fun, I usually sleep over. They have a guest room and the dogs come with me for the trip. I know what to expect along the way and when I arrive, and so do the dogs. However, last year, a college friend of my sister’s spouse also came for the holidays and brought their medium-sized, mixed breed dog. It began as a disaster and barely avoided ruining the get together. How and why? This friend, let’s call her Kim, is always a bit on the over dramatic side. Everything is the “worst” and few have had to deal with the huge difficulties she faces (Note the sarcasm). I expected to hear from her that the traffic was abominable, the people of our home state horrible, and all the rest. “Have him!” she shouted angrily and glared at the dog as she walked out. I squatted down next to him, spoke soothingly and he was soon wagging his tail and sitting calmly. I took out a treat and got him to follow me to the bathroom where I laid out almost all the clean towels and wiped him down until he was as clean as I could get him. By then, he was my new best friend. I took him for a walk where he was clearly still stomach sick at both ends and had to clean him up a bit more at the back door. I asked if she had a crate or bed for him. She didn’t. I asked about his food. She intended to head out in the morning to buy supplies. I asked how he was with other dogs. “I honestly don’t know,” she laughed. Sighing, I realized that the next few days were going to be interesting. I took Bo to the door of my room and let him sniff Janice and Leroy at the gap along the bottom. They whined at the thought of a pal, but Bo growled deep in his chest and gave me a bit of a scary side eye. I took my nephew aside and got him to make friends with Bo, keeping him in his room while I took my dogs out for their business and a bit of dinner and then got them back into a safe space before retrieving Bo. Needless to say, the dogs never played together and it became clear that Bo needed a lot of work with socializing and obedience. I gave him my best and he and I became fast friends over the weekend. Yet, I felt so guilty as I dealt with Janice and Leroy because this was supposed to be a treat for them. They love the kids, love romping outside with them, and love sitting by the fireside laying on one or both of the kids as they do so. My sister corrected her, saying “Nope…he is what you make him!” We then had a slightly heated debate about dog behavior. It was the only time that Bo was put into another room and my dogs brought out, where they showed themselves to be obedient, highly social and friendly. Long story short, Kim just expected Bo to travel easily, which he didn’t. She expected him to fit into the setting upon arrival without any support from her, which he didn’t. She also expected everyone to be okay with his behaviors, which we couldn’t be because we couldn’t trust him. So, if your dog is not socialized, not trained well, not familiar with the surroundings…and you expect it to be a simple matter of opening a door and walking in…well, you are expecting too much. I always say that you don’t know just how to travel with a dog until you actually take a trip. Rather than going to a weekend visit with others and other dogs as the test run, start small. Take an overnight to a hotel an hour or so away. 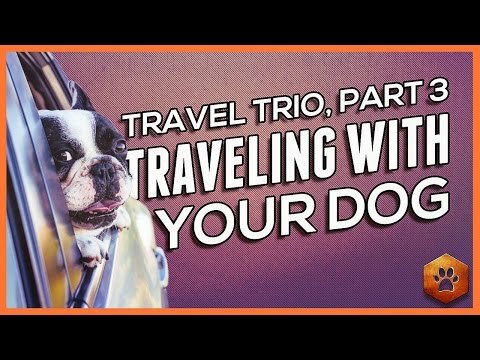 See how the dog responds to the situation, and then design training to help them enjoy travel more. It may take a few trips and experiences, along with a lot of work, but it is the only way to have safe and happy travel experiences. You cannot expect anything from your dog. You have to show them what is expected, and only then can they be happy. When I was in my early 20s and just out of college, I thought it would be brilliant to take a three-week road trip with my best college buddies. There were five of us, and we mapped out a journey we each had a personal connection to in some way or another. We didn’t anticipate the fact that after three days (rather than three weeks) we would be ready to happily murder one another. One hated everyone’s road music, one would not stop snoring, someone had super bad breath the entire time, another wanted to eat every few hours…and that was day one! Each night, we would setup tents or head to hotel rooms, and that is where we’d recharge in our own, blessed, personal space. There, it could be quiet or noisy. There, no one could bother you. Now, that was a great lesson for me in so many ways, but one of the best ways that it was a lesson was in the ways it showed me how to travel well with my dogs. After all, they might adore me, but after a while they too would appreciate a bit of space of their own. Dogs always need that; a space of their own. It is why you should always give a dog a crate that is theirs. It gives them a retreat, a spot to go when they need to be left alone or when they are trying to get away from someone annoying (whether human or four-legged). They need this when traveling, too. Janice and Leroy rarely look at the crate at home, but in hotels it is an island of safety for them. They are either on the bed with me or in their crate. It has a familiar blanket and familiar smells, and it gives them a defined space to protect. They never bark if they have their crate because they might feel threatened or spooked by something, but if they can get to me or the crate, they no longer need to defend the area and do lots of barking. Naturally, the crate is also ideal if you find yourself in a scenario like the one I experienced at my sister’s home. If she hadn’t given us the spare bedroom, the dogs would have been stuck in a room with Bo, and it could have gotten quite ugly. With a crate, you have a “spare room” for your dogs at all times, and one in which nothing can harm them. So, for their sanity and balance, and for your peace of mind, always give them the space that comes from using a crate while traveling. Yes, it can be a hassle to haul it in and out of a car and into a hotel or home, but the dog will really benefit. Though you might not know it to look at me, I’m a huge fan of cats. I think they are amazing creatures, and so radically different from dogs. I dislike when people own up to being a dog person or a cat person…there should be no such thing! I don’t have cats right now because Leroy is a jerk to them. He doesn’t mean any harm, but he gets all “handsy” with them, pawing and knocking them down. Then, he gets all offended when they hiss or swat at him, giving me that broken hearted look that says, “Oh my God…did you see what he just did to me!” And this after knocking the cat over or across the room! But, back to cats! I love them because they are such creatures of habit. They map out the same routes when let outdoors in the evenings, and they seem to have little wrist watches buried beneath their fur. One of my best friends has a cat that wakes her up at exactly 4:40 AM every day. She doesn’t even double check the clock anymore because the cat’s timing is so dead accurate. Yet, dogs are just as much creatures of habit. At least, they seem to thrive when kept to a very fixed routine. They are just like us (and cats, apparently) and like to wake up, use the facilities, eat, exercise, work, and do whatever it is they think they are doing, at the same time every day. They also like the familiar. The familiar spot on the sofa, the familiar blanket, bed, smell, and even treats or foods are all appealing to a dog. If you are traveling over the holidays, it is ideal if you stick to your dog’s usual routine, even if that is difficult. It can be challenging to get them out for a walk in a strange area or one that is unlike the usual spot. For example, we don’t live in an urban setting, yet we visit friends in New York City, and it can be tough for the dogs to get used to holding it until we reach the park a few blocks over. It is also tough for me to go out on a city street at 5AM and feel comfortable. The dogs know this and react with a nervousness that doesn’t subside until we are on our way home. These are all reasons that you’ll want to map out your dog’s daily routine and figure out how you are going to stick to it when taking a holiday road trip of any kind. Do they eat at specific times? Walk or exercise at a set hour? And what about socializing? My dogs socialize on a daily basis, and so I always have to find a way to ensure they can say hi to at least a few other socialized dogs during our travels. A lot of highway rest stops have modernized and have dog areas where they can do their business, get a lot of sniffs and smells, and even meet a few new friends. The point is to know what sort of routine a dog needs and stick to it as much as you can. This prevents bad or unexpected behaviors, potty or digestive issues, and turmoil once you return home. You are going away for the holidays and it could be to stay with family or friends, but then again it could be in order to just have a nice vacation for a week or so. And while you might be on top of all of the tips we’ve already given, you need to consider your dog’s potential activities during the holiday. Even a dedicated couch potato can develop a bit of cabin fever if they don’t get adequate mental and/or physical stimulation while away from home. For example, my dogs do walking and hiking with me whenever we go somewhere. I also look ahead to find out if any restaurants have outdoor dining areas where the dogs are welcome. This is good during the summer, but if they are not welcome, I usually skip eating out or get take out and eat with them somewhere pleasant. My dogs are highly socialized, so markets, parks, beaches, and just basic walking and sightseeing are all very easily done with them along for the fun. If your dog is trained and social, make sure there are plenty of dog friendly activities for them to enjoy. If not, make plans to ensure their safety and sense of security while you are out and about. For instance, a crate at the hotel is better than allowing them to roam freely. However, if you intend to be out for hours, it is best to spend time looking for a doggy daycare that you can use for those hours or even hire a pre-screened dog walker or caregiver to meet you and give the dogs a safe space to play or relax. If you are traveling for the holidays, you are going to probably be around an array of company. As an example, Janice, Leroy and myself are around my aging parents on a regular basis. Yet, we are also commonly in the company of my sister and her kids. We have friends who are my age and who have one of the world’s most mellow housecats. We go to places where there are people of all ages and backgrounds and where there is frequently a lot of food and noise, such as holiday house parties with tables covered with food, people playing instruments and kids rushing in and out. So, not only are the environments in which we travel going to be very different, but the people will vary widely. Some have loads of experience with dogs and know how to make my two feel at ease and happy. There are others who are a bit clueless and unaware of the need to behave differently with dogs, and because of this, my dogs have been desensitized to all kinds of behavior. You always sit and supervise the kids and dogs when they first meet and that you never (I mean NEVER) leave them alone as it is when you are not looking that a child tugs an ear or pulls the fur and a bit occurs. You never allow a dog unfamiliar with toddlers to meet one during a noisier house party or during a period of turmoil after travel. I would wait until it was very quiet, everyone was seated, and the child could meet the dog with a lot of gentle and respectful treatment. Adults are actually a lot more challenging than kids because you cannot influence the way that an adult acts with your dog. Because of that, I always gauge the company long before I bring the dogs into the mix. If there is someone I am not sure is going to be a good fit with Janice and Leroy, I simply leave the dogs in their room or the crate. If I misread the situation and suddenly see that one or both dogs are a bit agitated, I don’t wait for any potentially worrying behaviors (my dogs would never nip or growl, but they do tuck their tails and hang their heads far beneath someone’s hand if they don’t like them). At the moment I see discomfort, I get them to their safe place, which is usually the crate or room. And the company might also be other dogs. I always ask if the dogs are socialized or interact with other dogs. If the owners seem honest, I ask if we can introduce the dogs outside of the chaos of a party or gathering. I’ve never had bad luck with this approach, and most dog owners want their dogs to be happy and have fun, so it should work out if you ask about socializing and take steps to see that everything is “good to go”. Here’s the thing about elderly dogs – they are not all the same. Just like some elderly people are fully prepared to leap out of an airplane, some older dogs thrive on travel and the chaos of holiday gatherings in strange places. Other dogs that might have been a bit iffy on such matters in their youths are apt to be even more skeptical of gatherings as the years pass. Because of this, I would say that you need to be extra mindful of an older dog. Watch to see if they don’t react well to the noise and hustle of any holiday event. Watch how they act at home if the routine is shaken up a bit. If they seem to go with the flow, then travel should be fine. If they don’t seem to adjust so well any longer, reconsider what you are asking of them. It could be that your dog seems fine and then reaches a saturation point in the holiday chaos and travel. This is actually common of dogs at any age. So, simply be sure they have their crate if they want to “go home” during holiday travel. And be particularly careful about kids and older dogs. They may not be all that understanding of an older dog’s tendency towards grumpiness or a shorter temper, and you won’t want to leave kids alone with older dogs, either. Remember too that road trips can be taxing on an older dog who might be used to more frequent bathroom breaks and a quieter atmosphere. If your dog is in the senior category (usually over the age of 10), remember to stop every 40 minutes or so for potty breaks and stretches or walks. Make sure they are drinking enough water and watch their diet to ensure that travel isn’t upsetting the works. When Janice and Leroy are at home, they tend to bark a bit if the doorbell rings or someone knocks. This is a standard dog behavior. They are alerting me to the fact that there is someone there, and they are also excited to find out who or what is on the other side of the door. I have had to train them to remain inside, not jump on the person at the door, and stop barking once the door opens. That was a lot of training, and sometimes Leroy forgets himself and jumps a bit on the person entering if they are a particular favorite of his. When we travel, every door becomes their new front door, and I have to use a lot of commands to get them to chill out and behave. Typically, this is because it is mostly unknown or new people and smells arriving, and that can be dangerous. For instance, if I didn’t remind them to sit as I opened the door, they could dash outside and into danger. Controlling new arrivals and neutralizing the excitement around the front door ensures that any holiday gathering (whether at your home or as part of holiday travel) is safe and fun for all. Finally, and perhaps most importantly, remember that fender benders and accidents typically increase with road traffic. That means you may find yourself in the unfortunate position of being in an accident. Because of this, you need to keep your dog secured at all times. I never advocate a dog roaming a car while it is moving. After it is parked, go right ahead and let the dog bounce around inside of the car, but not on a roadway. I use harnesses that lock into the seat belts and urge all holiday road trippers to use similar safety restraints. I know it might seem limiting, but even a small accident can turn your dog into a high-speed projectile that harms you and might even end the dog’s life. There are many systems for securing a dog, and some work as car seats (for smaller dogs) while others operate like human seat belts that allow the dog enough leeway to sit up and gaze around or lay down on the seat and snooze. The point is that you know how to travel in a way that keeps the dog safe even if there is an accident. You can travel well with your dog during the holiday and winter seasons (and all year long) when you follow these tips and tactics. It requires a bit of time, training and expenditure, but it can allow you to bring your best buddy or buddies along on every road trip and adventure, and there is really nothing better than that!